The Russian River Valley community mourns the loss of noted winegrower, Charles Bacigalupi. He grew up in the suburbs of Santa Rosa where his family ran the local market named after the family, Bacigalupi Market, first established by Natale Bacigalupi in the early 1900s. Charles’ mother, Olive Gaddini (Olie) was a homemaker and artist. Charles’ father, Albert Bacigalupi, ran the local market and made wine that he sold in gallon jugs at his store. Charles attended local schools including Santa Rosa Junior College when his education was interrupted by World War II at the age of 18. He joined the navy and was assigned the duty of a dental assistant sparking his interest in the field of dentistry. After the war ended, Charles returned home and finished his prerequisites at Santa Rosa Junior College. He first met Helen Long in his final year of school there. Both Charles and Helen attended University of California at San Francisco and were married soon after their graduation in 1952. They returned to Healdsburg where Charles started his dental practice. He would practice dentistry in Healdsburg for the next 39 years. Helen was trained as a pharmacist, an unlikely profession for women of the time. Charles had a love of the land and had dreamed of owning his own ranch. 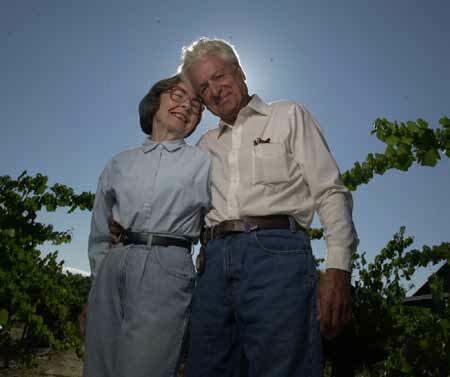 In 1956 Charles and Helen bought the Goddard Ranch, 121 acres on Westside Road that was mostly planted with prunes, cherries and apples, with a few acres of Golden Chaslis, Mission, Muscat and Zinfandel grapes. In this era in the Russian River Valley, prunes, cherries, apples and peaches took precedent over wine grapes and were assigned to the prime growing sites, relegating grapevines to the poorest ground. Wine grapes were almost an afterthought since fruit trees were the money crop. Charles was at least hopeful that the sale of wine grapes would cover the property taxes. Neither Charles or Helen knew much about winegrowing, but they both had a green thumb, a scientific background, and enjoyed working in the outdoors. Through his dental practice, Charles got to know many of the local grape growers, including one patient in particular - Paul Heck. Paul and his brother Adolf L. Heck, Jr., had acquired Korbel Champagne Cellars in Guerneville in 1953. Charles was interested in expanding his limited wine grape plantings since the white grapes they were farming brought little income. Paul advised Charles to plant Pinot Noir and Chardonnay. He told Charles, “It’s cooler over there in the valley near the river.” Charles also heeded the advice of Bob Sission who was the farm adviser in Sonoma County for University of California at Davis. Sission also recommended the planting of Pinot Noir and Chardonnay based on the heat summation studies of Albert Winkler and Maynard Amerine. Charles reportedly had to write down the names of the grapes to keep from forgetting them and the only thing he know about those varieties was that they were grown in France. Neither Charles or the locals of the time had any interest in or knowledge of Pinot Noir and Chardonnay, the two varieties that now dominate the Russian River Valley landscape. Eventually, Charles obtained Pinot Noir and Chardonnay budwood from Karl Wente’s vineyard in Livermore. Charles first planted the budwood on the family’s home ranch in 1964, among the earliest plantings of Pinot Noir and Chardonnay in the Russian River Valley. The Pinot Noir selection is thought to be Pommard and the Chardonnay was the now ubiquitous Wente clone. Charles was a self-taught winegrower and learned about viticulture through experience and trial and error. His success is reflected in the countless wineries that have sourced Bacigalupi fruit through the years. Even when Charles was well into his late 80s, he could be found in his vineyards on a tractor disking the soil or in his garden tending to vegetables. Recently, Charles and Helen were honored by the Healdsburg Library and Historical Museum at their 15th Annual Pioneer Award Dinner. In addition, the Sonoma County Wine Library recorded and printed their oral history. Charles is survived by his wife Helen Bacigalupi, son John Bacigalupi, and granddaughters Katharine Row Bacigalupi and Nicole Derrico Bacigalupi. John teamed with his spouse, Pam Heck Bacigalupi, and fourth generation nephew and winemaker Tyler Heck to found John Tyler Wines in 2002. John and Pam’s twin daughters, Katharine (Katey) and Nicole, became the face of John Tyler Wines and were instrumental in the building of a tasting room on Westside Road to feature the wines. 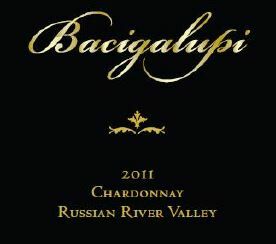 To honor the legacy of the winegrowing Bacigalupi family, the name of the winery is being transitioned to Bacigalupi Wines, and the transition will be completed beginning with the 2012 vintage.